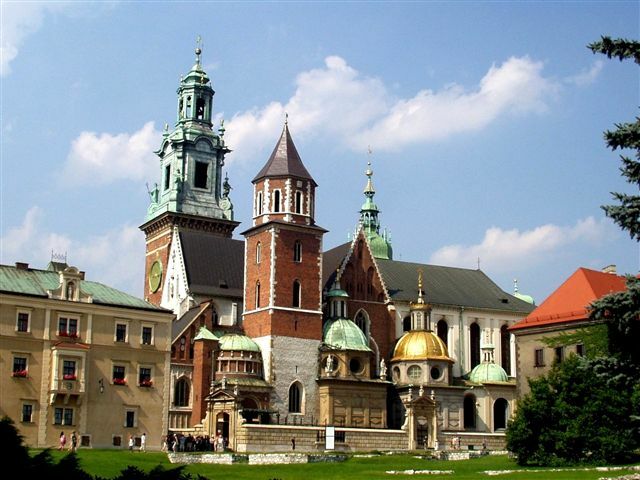 The Cathedral on the Wawel Hill is a place of worship of top significance. It is due to the role that temple served over the centuries. 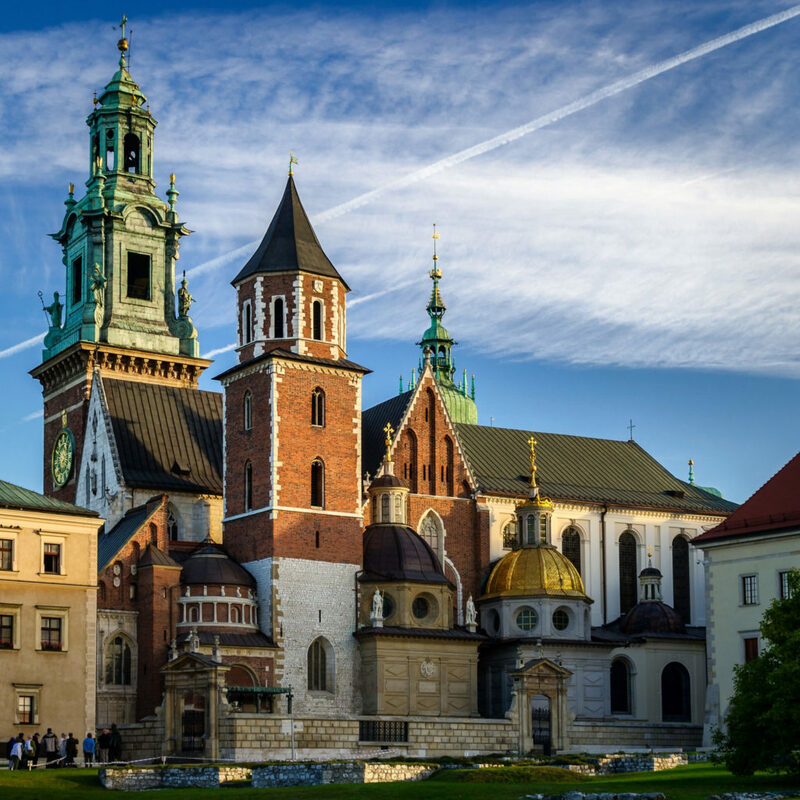 From the reign of the very first King of Poland, Boleslaw Chrobry, son of Mieszko I, the Wawel Hill was a site of the most important Polish diocese. In the year 1000 construction of the first roman Cathedral began. A century later the Wawel Cathedral was rebuilt but burned down in the fire. In the 14th century the Cathedral was once again rebuilt into the magnificent Gothic edifice it is today. In 1320 King’s Wladyslaw I the Elbow-high coronation took place in the Cathedral. From then on it had served as a coronation site of the Polish Kings. The Cathedral was also the main burial site of monarchs. Being the most significant and prestigious diocese in Poland, only the noblest could host the position of the bishop. From outside, many elements of different architectural styles are visible in the Cathedral exterior. The facade with the rose window is a reminder of the 14th-century Gothic edifice. During a course of a few centuries, several chapels had been added to the Cathedral, including Renaissance Sigismund’s Chapel. It was founded by King Sigismund I the Old as his ancestral chapel. With the golden dome, it is a breathtaking example of Renaissance architecture in Poland and one of the most beautiful Renaissance chapels in Europe. From the outer courtyard, the Cathedral is separated by three Baroque gates constructed in 1619. The Cathedral has three towers. The Baroque tower in the rear was originally part of the fortification. It was joined with the Cathedral in the 16th century and the Sigismund Bell was installed in the tower. The Sigismund Bell is an enormous bell donated by King Sigismund I the Old in 1521 and named in his honour. Visitors can climb up the tower’s stairs to see this giant bell that had become one of the Polish national symbols. The baroque clock-tower at the front is the highest point on the Wawel Hill. It was founded by King Casimir III the Great in the 14th century. The present-day tented roof was constructed in 1715. The third tower is called the Silver Bells Tower, thanks to four partially silver bells located in the tower. The interior of the Wawel Cathedral is overwhelmingly rich. Most of the interior remained Gothic, except for the chapels. Eighteen chapels surround the Cathedral’s main nave. All of them are hiding unique treasures and are decorated lavishly. The “pearl of Renaissance”, white Sigismund’s Chapel contrasts with neighbouring Baroque Vasa Chapel built in black marble. One of the most intriguing is the Holy Cross Chapel with polychrome created in 1470 by Russian artists and 1492 marble sarcophagus of King Casimir IV Jagiello. Many more marvelous sarcophagi can be found in the Cathedral, with examples like 15th-century sarcophagus of King Wladyslaw II Jagiello made entirely of red marble. The Cathedral is illuminated by several stained-glass windows, an element characteristic of Gothic architecture. But most of the Cathedral’s stained-glass windows were installed there at beginning of 20th century. A number of walls in the Cathedral are also decorated with early-20th-century polychrome. In that time, the Art Nouveau era, the most revered artists worked in Krakow and cultivated the revival of traditional arts and crafts. 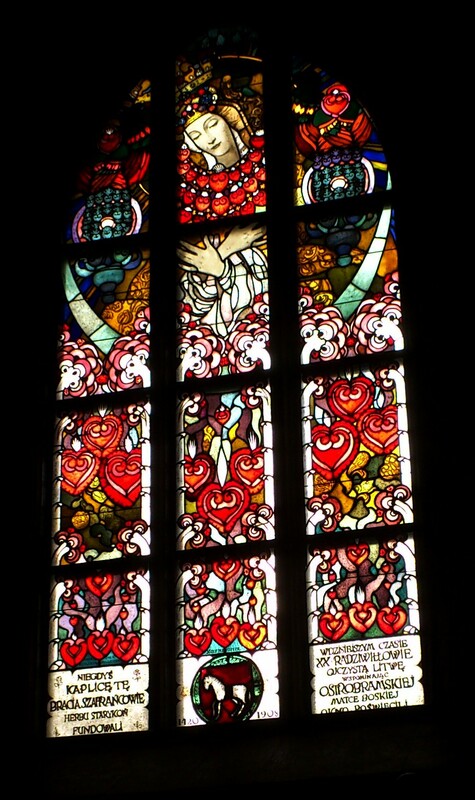 Unique works of artists such as Jozef Mehoffer and Wlodzimierz Tetmajer can be admired in the Cathedral. The centre of the main nave is occupied by St. Stanislaw’s mausoleum. St. Stanislaw was an 11th-century bishop, devoted to the development of Catholic Church in Poland. Due to a conflict with Polish King, Boleslav II, he was murdered at King’s command. History of St. Stanislaw remains a subject for many controversial theories. He is considered a national martyr and is a Polish primary patron. 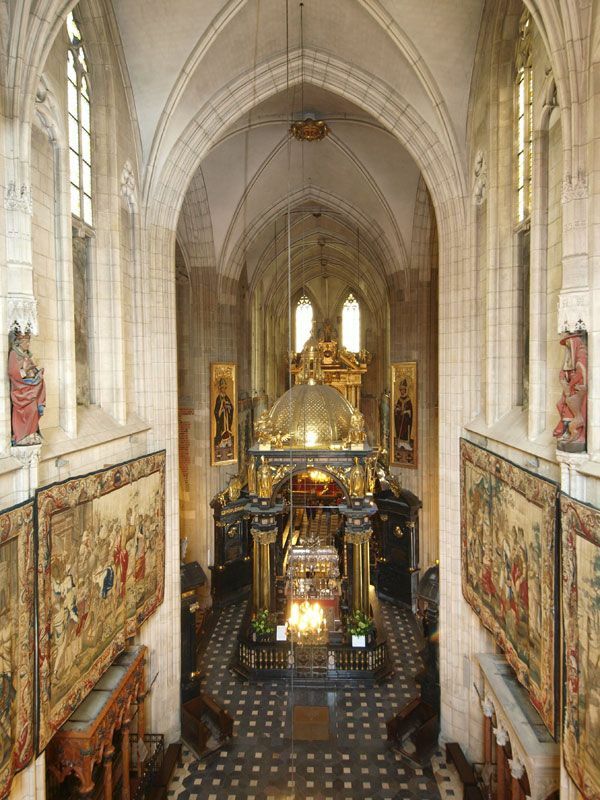 The mausoleum dates back to 1254 when St. Stanislaw’s relic was placed in the Cathedral. From then on, a number of founders, mostly Polish Queens, contributed to the mausoleum. For centuries it was also a custom to place war trophies and symbols of national victories at its altar. In the heart of present-day mausoleum stands circa 1670 silver coffin embellished with twelve relief scenes from St. Stanislaw’s life and posthumous miracles. The mausoleum stays in front of the baroque altar, where the coronations of Polish Kings took place. Today’s altar is a 1650 work of gilded wood. 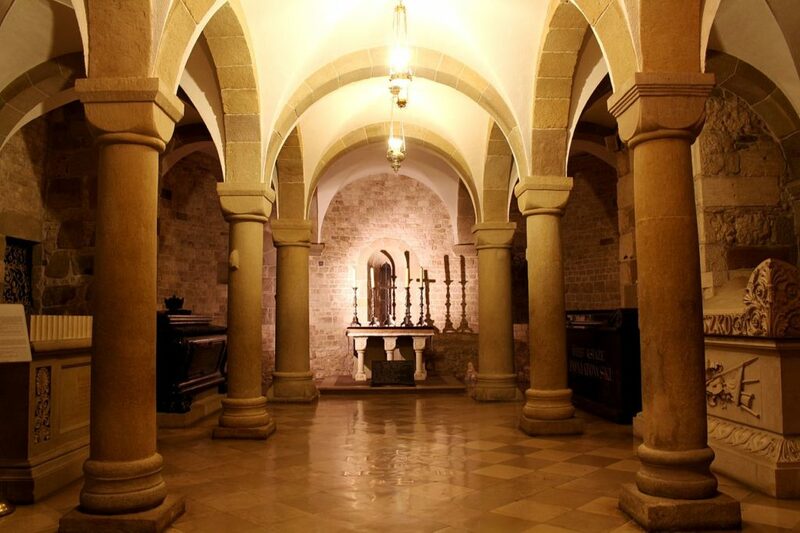 Crypt in the Wawel Cathedral was turned into the national mausoleum in the 16th century when King Sigismund I the Old introduced Renaissance trends to the Wawel Hill. While Polish medieval Kings were buried under the Cathedral’s floor, from the 16th century they were laid in the Crypt. From the 19th century, also national heroes have been buried in the Crypt as a sign of national gratitude and a way to honour them. In the first part of the Crypt, the National Bard Crypt, two of the most important Polish poets were buried – Adam Mickiewicz and Juliusz Slowacki. A monument for Cyprian Kamil Norwid was placed in the Crypt in 1993, on the 100th anniversary of poet’s death. There is also a grave plaque, identical to the original one, dedicated to Fredrick Chopin, one of the biggest Polish artists of all time. St. Leonard’s Crypt dates back to the 11th century and is the only existing part of the second roman Cathedral, the one that had burned down before construction of the Gothic edifice. It is the burial site of King Michael I, King Jan III Sobieski and his beloved wife, Marie Casimire, as well as national heroes Jozef Poniatowski and Tadeusz Kosciuszko and general Wladyslaw Sikorski. Royal tombs consist of several chambers connected by passageways. Polish monarchs with their spouses and occasionally children were buried in this Crypt, starting from King Sigismund I the Old in 1548. In the last Crypt, one of the most important figures in Polish history, Marshall Jozef Pilsudski has his tomb. In the vestibule of this Crypt, President Lech Kaczynski with his wife were buried in 2010 after an airplane crash in Smolensk, what was a controversial decision still questioned until today. In order to make the Crypt accessible for the visitors, in the 1872-1877 renovation was conducted by renowned Polish artist, Jan Matejko and the team of experts. Cathedral 9 a.m. – 5 p.m. 12.30 p.m. – 5 p.m. 9 a.m. – 4 p.m. 12.30 p.m – 4 p.m. Ticket sale 9 a.m – 4.30 p.m. 12.30 p.m. – 4.30 p.m. 9 a.m. – 3.30 p.m. 12.30 p.m – 3.30 p.m.
* The Cathedral is closed for visitors on: New Year’s Day (1 Jan.), Maundy Thursday, Good Friday, Holy Saturday, Easter Sunday, All Saints’ Day (1 Nov.), Christmas Eve (24 Dec.) and Christmas Day (25 Dec.). The Cathedral Museum is closed on holidays. Sigismund Bell, Royal Tombs and Cathedral Museum (one combined ticket). * Reduced ticket: children, school youth, students, teachers, senior citizens, and pensioners, whether from Poland or abroad, upon presenting the relevant document.